PlusUrbia’s Little Havana Me Importa: Holistic Guidelines for Social Equity, a Livable Community and Healthy Outcomes in Miami’s Most Historic Neighborhoods project has been selected as a finalist for the 56th IMCL Design Awards competition. Design Awards winners will be announced June 19 during the International Making Cities Livable Conference in Portland. PlusUrbia founding principal Juan Mullerat will also be a featured speaker at the conference. 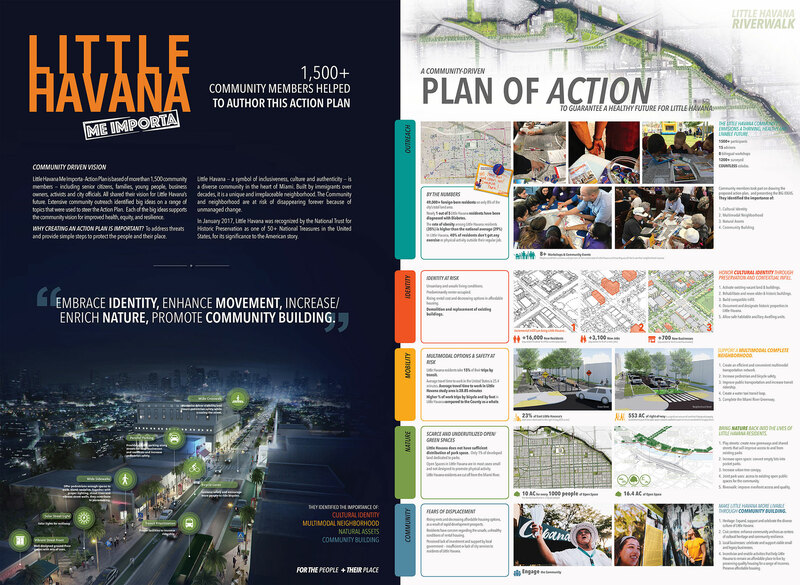 The Little Havana Me Importa plan creates guidelines for healthy, resilient and more affordable solutions for Little Havana. The plan respects Little Havana’s small-scale, culturally rich and dense community. It creates a more livable city while protecting residents, neighborhood character and historic buildings. More than 3,000 residents and stakeholders provided input and drove the vision and objectives for Miami’s most diverse and historically significant neighborhood. Reinforce and enhance cultural identity. Establish a multimodal transportation system. Increase and enhance natural assets. Incentivize community building with guidelines that retain the essence of Little Havana, including requiring new construction to match the neighborhood’s character and scale. Support affordable housing while introducing a mix of incomes and increasing home ownership within low-rise buildings. PlusUrbia is a planning a design office that often works with national and local partners to strengthen and improve its work. “Little Havana Me Importa Plan” is a partnership between the National Trust for Historic Preservation and Plusurbia Design with the collaboration of the Health Foundation, Dade Heritage Trust and Urban Health Partnerships. Their involvement was key to deliver a project that is relevant and provides solutions catered specifically to the needs of Little Havana, its culture and its people. Visit https://www.livablecities.org/ for more information about International Making Cities Livable Council.